The ways in which people change and grow, and learn to become good, are not only about conscious decisions to behave well, but about internal change which allows a loving and compassionate response to others. Such change can take place in psychotherapy; this book explores whether similar processes can occur in a religious context.Using the work of Julia Kristeva and other post-Kleinian psychoanaly… sts, change and resistance to change are examined in the lives of John Wesley, the founder of Methodism, and his brother Charles, the greatest English hymn-writer. Their mother's description of them as young men as 'two scrubby travellers', was a prescient expression indicating their future pilgrimage, which they negotiated through many struggles and compromises; it points towards the 'wounded healer', a description which could be applied to John in later years. The use of psychoanalytic thought in this study allows the exploration of unconscious as well as conscious processes at work and interesting differences emerge, which shed light on the elements in religion that promote or inhibit change, and the influence of personality factors. 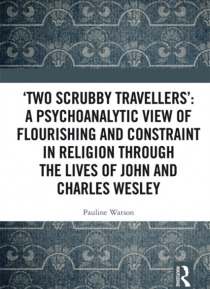 'Two scrubby travellers': A psychoanalytic view of flourishing and constraint in religion through the lives of John and Charles Wesley enriches our understanding of these two important historical figures. It questions the categorising of forms of religion as conducive to change and so 'mature', and other forms as 'immature', at a time when many, particularly young people, are attracted by fundamentalist, evangelical forms of belief. This book will be essential reading for researchers working at the intersection of psychoanalysis and religious studies; it will also be of interest to psychotherapists and psychoanalysts more generally, and to researchers in the philosophy of religion.